We took over a 964 supercharger project early last year that had been done by someone in Europe. Despite our best efforts at making it reliable, it really needed to be reworked completely. The main issues were getting the car boost leak free and keeping intake temps down sufficiently that the engine would not pull back on the power. The car was quick (in manual form) but it never really felt spot on - the point of a supercharger is ideally to bring in lots of torque throughout the rev range and it always felt far too linear - you really had to rev the nuts off it to get it to go. When we received the car, the peak boost was around 0.42 bar. We did manage to get it up to 0.6 bar briefly at the top of the rpm range, but as soon as you fixed one boost leak, another one started. Remember na 964 is not designed to have boost put through it. In the end I think the concept was good, but the delivery was poor. So the customer put the car to bed with our agreement, and we said that we would like to prove the concept on one of our own cars first, taking into account some of the issues we had found with him. So we purchased a 964 (actually in tiptronic form) from Japan as a donor car. And so the project started. The project has taken about 5 months in total, working in between normal business of course. We decided to take the engine out, do the upgrades and try and get it boost leak free if possible. The design of the customer project was actually quite poor - the concept of just bolting on a supercharger seems easy, but there was a lot that wasn't thought through. 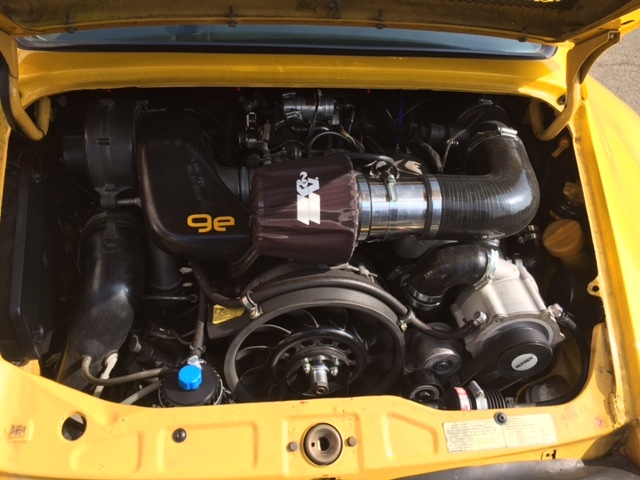 He had had a aquamist water/methanol injection system fitted to lower intake temp rather than intercooler but it was never reliable - we have a lot of successful experience with these system on our other 9e cars, so the concept of using water injection instead of an intercooler (space issues) was something we wanted to continue with. In terms of the supercharger, the customer car had rotrex supercharger on. Again this was something that we were happy with - it has a separate oil cooler unlike some superchargers, so using this would be fine. So we decided to replicate what was on the original customer car, but see if we could get it working properly. Same supercharger, same aquamist system and so on. We designed a boost leak testing system (using pressure not smoke) as we have for 996/997 turbos. It was quite shocking on a standard NA car the amount of places it would leak from. We gradually worked solutions for each, creating custom pipe work to replace plastic/rubber connections etc. A lot of CNC parts, but you get to the point of trying to seal up one component that has multiple outlets and you just say screw this, lets remake the part in alu so it will never leak. We had to remove the a/c unit, to locate the supercharger. And then we created custom hardpiping (using a similar concept to maximum airflow to the supercharger like we do on turbos). Now, the tiptronic box - it will have its lovers and haters and in a 964 it is quite basic but in manual mode it works pretty well. But we knew the limit of the torque would be too low. We managed to upgrade the box to hold 500nm tq with the help of a company in the UK who specialised in these boxes (the boxes are used in landrovers etc). Bolt the car all back together, do the tuning and car was ready earlier this week. Now with a NA car with compression ratio of 11:3, strictly speaking the concept of running anything more than 0.35-0.4 bar is dangerous. You need a much lower compression engine (9:0 or less) to start running over this. But, we took the decision that the engine could be resolved (e.g. build a lower compression engine at a later date) as the most important thing was whether the car could be boost leak free, with lower intake temps etc. Now, remember the customer car I mentioned. We only saw regularly 0.45 bar or so, and when we had tried to fix some leaks in situ, we had seen 0.6 bar at one brief moment before it leaked again. Want to guess what boost we saw on ours with the same supercharger etc? And never mind the boost, my god what power. It actually felt far too quick The torque fill is amazing - completely different to the customer car - actually feels like a turbo. We brought the car back in after its first road test. Now we faced an issue - too much boost for the compression, so we did a little modification to the tune to help as much as possible. Alternatively we could, if we wanted, put on a larger pulley wheel in the supercharger to reduce boost. Since it is our shop car, the leave the boost where she is won the day. - we know we need to build the engine at some point, and frankly running the car at a higher boost level will be a stiffer test of the whole supercharger set up. 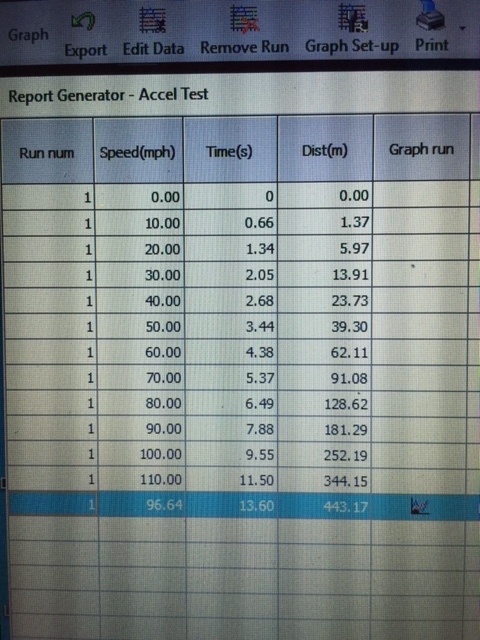 Prior to the upgrade we did a run and recorded 0-60 in 6.1 seconds, 0-100 in 11.6, 0-110 in 17.8 seconds. Yes yes very slow I know. Now, 0-60 4.38 seconds, 0-100 in 9.55 and 0-110 in 11.5 seconds. and top speed is just a few miles an hour short of 180mph. 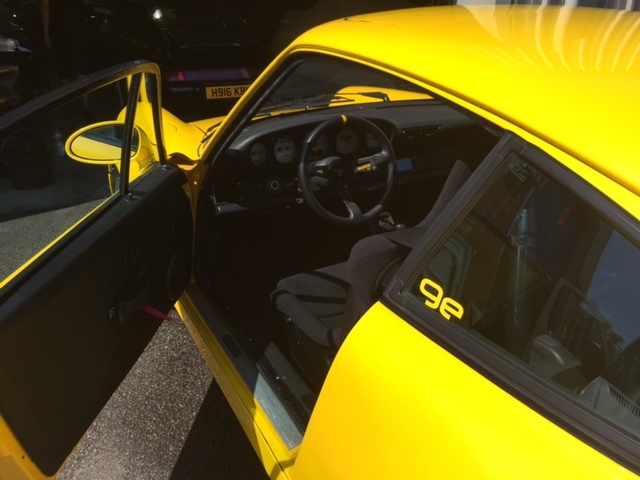 To give some idea, the 60-100mph is as quick as a stock 996 Turbo. 996GT3 is also 9.5 seconds to 100mph. I would say she has around 400hp, certainly at this boost level. We plan to run her for two days at Spa in early April. Of course she has lots of other things, like full suspension, runs 3.25 d camber all round, pss10s, solid this, solid that. Anyway, I have been driving her everyday for the last week. It is the most fun car I have driven in a long time, stupid fast in any gear. Hopefully the engine will hold up and we can prove the concept works, in which case, we can either lower boost to run on a stock engine, or up the boost on a lower compression engine. Keep you updated how she runs. Do you still get lag like a turbo car? I've been avoiding making my 964 quicker, because if I want to go faster then I can use my 996 or Cayenne turbo, but this is tempting. Fun is the key word. It just makes you smile all the time. No lag and you still feel like you are driving a NA car - boost is linear. I think the concept is this - a 3.6 to 3.8L conversion is expensive and really does not gain huge amounts in terms of power unless you get into different cams and so on. 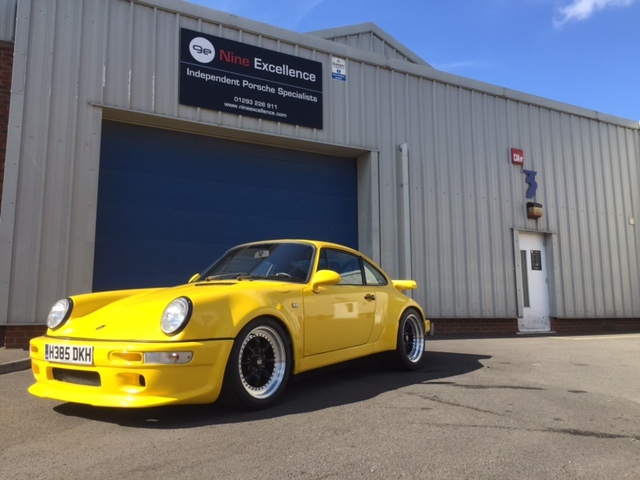 We are planning to do a 4L version of a 964 later this year - that is all spec'd out now and shouldn't be an issue, in fact it will probably be 4.1 or 4.2L. The real question is whether you can get a reliable level of performance with a supercharger. We could go even further and just build a complete custom intake like GT3 style but you have to look at cost here. You have to remember a decent 3.8L 964 build is close to 20k if you use all the right parts to maximise hp. I think (although don't hold me to this) that what we have done is probably a 10k upgrade. It is not just supercharger and aquamist - you have 993 Turbo fuel pump, injectors, maf conversion, lots of cnc custom parts etc. I think on a stock engine with larger pulley size so to keep boost around 0.4-0.5 bar you could still achieve a solid 320-330hp. Space is the issue for fitting an intercooler hence why we have stuck with aquamist system - you have a tank in the front and just fill with water. It currently triggers at 0.4 bar approx to cool intake temps. 320 BHP seems like a poor return for the investment when a good 3.6 can give 300 without much effort or cost. Add in significant extra weight, complexity and inefficiency of the system and it seems rather pointless other than in novelty value. the 320 is conservative - anyone knows we under promise and over deliver. I am only guessing that figure based on performance and remember a 964 turbo has 320ps. On a stock 3.6 you might get to 280-285 peak at a push- only an exhaust gives real performance on these cars and a maf conversion is at most worth 3hp but does give you better control over fueling. So I would disagree that you could get to a real 320 for 10k because you would be into cams etc. However more important is the power under the curve - with the suoercharger you have substantial hp at lower rpm so the car is significantly quicker - it is all about power under the curve. As to weight, there was a net 9kg difference since the car had air con unit already which is removed to locate the supercharger. I can imagine the current config is quick, the question is for how long? Going through 400 bhp on stock rods and crank is pushing it. A 3.6 with cat bypass and remap can make 300 bhp if its in good health. More aggressive cams and injectors will see that rise and these are fairly cheap mods. While the supercharged cars will produce more torque they also lose the character and efficiency of the standard car. Touring mpg of 20 mpg? Given what needs to be done to make it reliable it is not a cheap or popular option. It is complex - don't get me wrong and of course the most important thing is reliability. Btw - 964 stock rods and crank can take 700hp / that is not the weak point of a 964 engine. We know this. There are a lot of inflated hp claims. I do love to see people just saying "Hey, I know, let's just see if we can fit that pint into a quart pot" I for one would love to have a go in that car Ken. Any update on how it went at Spa? So the car handled (from a set up point of view) amazingly at Spa with all the upgrades we did. We did however have a couple of engine issues. Both of which we resolved with temp fixes. The main issue seems to be the breather system which you need when running pressure through. The breather pipe that we fitted (similar to a 996 Turbo one) got blocked - this was a gradual process that only really got found on track when power started to come down. We managed to fabricate a larger breather at Spa which worked fine and all of a sudden it was back to full power. Now looking for a more permanent solution to that. We also lost a belt on the second day of testing on actually one of the best clean laps. We need to modify the pulley slightly to avoid this happening on the supercharger. We had spare belt so was not an issue, but was frustrating given we had finally got the car back re the above issues. In terms of power, when it was running right, we managed a 2,58 lap which was respectable in testing, but the other issue (brake bias - too much locking up on the rear) slow braking points for us. I think the car is capable of low 2,50s. Planning to resolve both issues during the summer and take her back to Spa for more testing. It is not reliable yet - I think that is the point from the testing. However generally there is good hope that with a few more modifications it could be. Will update after next Spa trip. Thanks for the update, great to hear you're still making progress. Thought I would give an update on this. So having tested during 2016 on track several times including journey to Spa etc, we have identified a couple of issues which need addressing but the good news is that these are minor issues. The car runs very well and performance is excellent. So on that note, we had been running 5-6psi on the stock engine, but decided, since it was our car, to up the boost to 10psi, despite the fact that the engine was stock, with stock compression. The stock compression of 12:3 does not lend itself to running boost over 5-6psi but we wanted to see how far you could push. So I think if we do offer this, then there will be a stock version, and an upgraded version with engine compression being lowered. 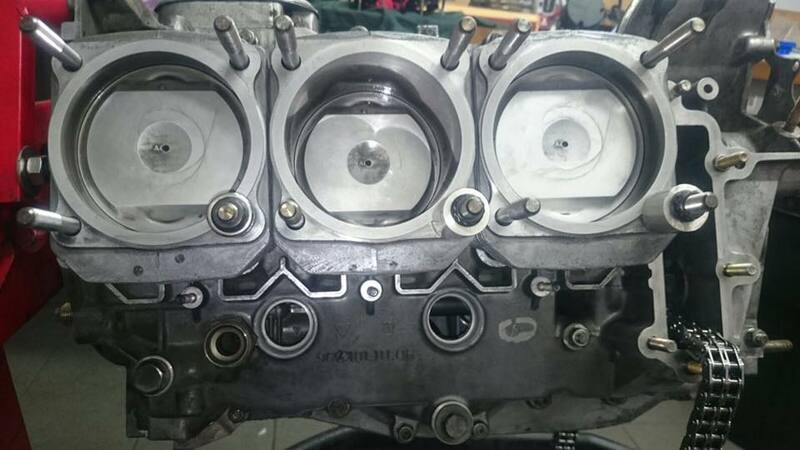 However the latter will be permanent - once you lower compression, if you wanted to remove the supercharger side, then you are not going to have an engine that performs, so you would have to rebuild with new pistons. Lots to update - will do so later tonight.